When it comes to mainstream laptops, they all sort of have the same specs. You get a CPU from Intel (or maybe AMD), memory and storage from Micron, Kingston, WD, or Samsung, and maybe a graphics card from Nvidia. So how else are computer makers supposed to entice potential buyers? Well on Samsung’s latest laptops at CES 2019, it thinks superior styling is the answer. Starting with the flagship Notebook 9 Pro, Samsung took some elements from the Notebook 9 Pen it announced a couple weeks back and then created an all-new aluminium-bodied 2-in-1. Then Samsung sanded and polished each panel to the point where can sort of see the aluminium's grain, while adding little touches like diamond-cut edges and sturdy sides that are ribbed for your pleasure. And the result actually leaves Samsung with a distinctive look that stands out from the MacBooks and Surfaces of the world, even though the materials it used aren’t all that different. And it’s not just all style over substance, because thanks to its aluminium frame, the Notebook 9 Pro feels surprisingly light. 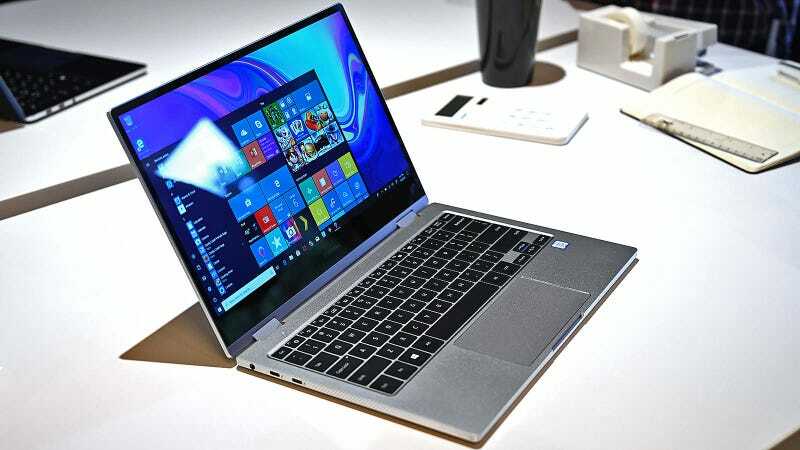 As for specs, the Notebook 9 Pro also comes with an Intel Core i7-8565U CPU, 8GB of RAM, 256GB SSD, fingerprint reader, an included stylus with 4,000 levels of pressure sensitivity, and a fair amount of ports (2 x Thunderbolt 3, plus a regular USB-C and microSD). The Notebook 9 Pro even offers dual 1.5 watt speakers with a dedicated amp to help pump out the jams. Unfortunately, the room Samsung booked to show off its new laptop was too loud to actually get a sense of how those speakers perform. That said, the one design decision I don’t get is the lack of built-in storage for the Notebook 9 Pro’s Active Pen. Inside the front right palm rest, there’s a little magnet that holds the stylus when it’s not in use. Unfortunately, you can’t actually use it that way because that’s exactly where your hand needs be when typing. We already live in a world where systems like the Surface Pro, HP Folio, and Yoga C930 come with proper places to stash a stylus, which makes Samsung’s curious magnet placement seem a lot like an afterthought. Alternatively, if you think the Notebook 9 Pro looks a little too serious for you, the new Notebook 9 Flash is almost a complete 180. Instead of premium materials like aluminium, the budget-friendly $350 (UK pricing TBA) Notebook 9 Flash features a plastic design that I’d almost call playful. It has bigger typewriter-style keys that are allegedly better for kids, though I must say I’m not quite as big of a fan. But the Notebook 9 Flash’s real divisive style choice is the use of textured panels that feels like a mix between concrete and the kind of rugged plastic you’d find on a playground jungle gym. It’s rough and sort of craggy, but I admit, it is unique. The Notebook 9 Flash’s lid sports a grid of dashes and lines that look like sprinkles, or jimmies, whatever you call the rainbow crap people put on ice cream. The Notebook 9 Flash is truly going to be a love it or hate it machine, but that’s the risk you take when you try to push style to the extreme. Inside, due to the Notebook 9 Flash’s more grounded budget, you only get Intel Pentium or Celeron CPUs, 4GB of RAM, and 64GB of eMMC storage, which makes this thing the Windows-based equivalent to many of the new Chromebooks released at CES. So will Samsung’s style play actually work out? I’m not so sure, because while I think the Notebook 9 Pro offers a fresh take on laptop design, I already know the Notebook 9 Flash’s bumpy body isn’t for me. The Notebook 9 Flash goes on sale January 15th, while the only release info we know so far about Notebook 9 Pro is that it will be available sometime in early 2019.